Coming up with good drink special ideas to attract people to your bar, restaurant or club can make a huge difference in the popularity and profit margin of your place of entertainment. Drink specials offer a way for you to increase awareness of your bar and promote your bar as a place to go on certain nights. Choosing the right drink special ideas not only takes a little market research, but also proper forecasting to ensure that such a drink special is a good business move for the bar. Beer specials during sporting events or on certain nights almost always attract a crowd. For example, discounting imported beers during the World Cup appeals to many people. Offering a free beer with a dinner entrée is also a way to get people to come to your establishment when they get off work. Discounting domestic drafts one night a week is also a popular choice for bars; price the beer according to competitors, the location of your bar and your customer base. Another option is to offer bucket discounts; buckets of ice stocked with five or six beers can be discounted a little bit to encourage group purchasing of beverages. Pitcher deals also lead to more group purchasing. Offering mixed drink discounts appeals to those who enjoy cocktails. This can be done in rotation with beer specials. 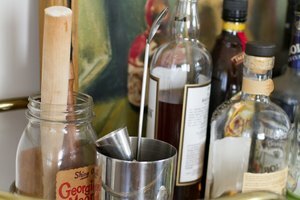 One current trend in cocktail drink specials is to select one type of liquor, such as vodka, and make that drink and any choice of mixer discounted for the night. For example; every Thursday could be $3 vodka night at your club or bar. Another option is to have certain popular mixed drinks be specials, such as whiskey and coke, gin and tonic or popular cocktails like a tequila sunrise or Manhattan. Simply pick a discount method, such as buy-two-get-one, and advertise. Pick a night you think can become the place to go for that night. A good deal of drinkers enjoy straight liquor, and having a night dedicated to discounted shots or cheap whiskey on the rocks drinks is a good idea for most establishments. Having high-quality Scotch on the rocks at a discounted price most certainly caters only to a certain group of drinkers, but also diversifies your bar's market. Having two-for tequila or whiskey shots also draws a wide range of people to your bar. Another innovative idea for a bar or club to offer is to allow the purchase of whole bottles of liquor at one time. This is a method for attracting groups of friends to an establishment by allowing them to save money through making a larger purchase. Also, it gives your bar the opportunity to make money through higher sales volumes. However, allowing whole bottles to be purchased at once may lead to rowdiness. Use bouncers, security and other methods to keep it under control. Hosting other specials during certain times is a good idea as well. Having a happy hour every Friday is a common special at most bars, and it is best to offer a wide range of drink discounts during this time to expand your customer base. Hosting drink specials every Sunday during football games can also make your establishment a regular spot for many. Beers of the month, ladies' nights, businessman specials and birthday discounts are other drink special ideas.